A huge part of baby’s development is learning through play. Helping baby’s development does not require playing with expensive or complex toys. Everyday objects can be used to entertain baby and build their motor, sensory and communication skills. Using items with a variety of textures, colors, sounds, and patterns are the best way to engage baby. Simply look around the house to begin exploring and learning together. Make your own shaker: you can use a water bottle filled with pasta or beans. During play, shake it from side to side to encourage baby to look in different directions. This game stimulates baby’s hearing and builds neck muscles. As baby gets older you can use smaller plastic containers so baby can shake and hold it themselves. Homemade mobile: a clothes hanger can be the frame for baby’s mobile. Attach 2-3 colorful, interesting items such as pictures or paper cut outs. You can switch out items occasionally to keep your little one interested. The mobile should not be within baby’s reach. Baby container surprise: stuff some squares of fabric into a baby wipe container and let baby pull them out. Fabrics should have different textures and colors to stimulate baby’s sense of touch and vision. Swiping games: encourage baby to swipe at objects held in front of them such as a scarf. Have baby practice “raking” movements by letting them use their fingers to grasp and pull objects. Hold the item in different positions to encourage reaching from side to side. Transfer from hand to hand: show baby how to transfer a household object, such as a large cooking spoon, from one hand to the other. Help baby by guiding their empty hand toward the spoon. Gently grasp your fingers over baby’s hands if they need more help. Exploring Texture: provide baby with some objects from around the house that have different textures– soft, hard, fluffy, scratchy. These could be objects such as a knit hat, a large sponge, or cotton blanket. You can also provide items that make different noises when banged together or dropped. Playing with these items will stimulate baby’s sense of touch. You can go through and describe each as baby picks them up to explore. Pillow climbing: once baby is crawling, allow her to crawl over pillows and cushions while you are supervising. The exercise builds baby’s core, arm and leg muscles. 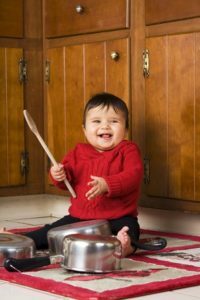 Rhythm and music: household items can be used to show baby how rhythm and music are made. Try grabbing a couple pots or pans and a wooden spoon. Show baby how to make a rhythm and spend the afternoon making music. With just a little bit of imagination, all of these household items become fun toys for baby to play with. Learn the stages of play your child will go through to help understand what types of activities may be best for their development at different ages. * All of these activities for baby should be done under adult supervision. Parents and caregivers should be sure to avoid objects that are sharp, dangerous, or that could pose a choking hazard for baby. Want more information on play? Read this to find out 3 things you probably didn’t know about play. There are many benefits to water play for kids including working on balance, coordination, and more.